As a former log truck driver in another era, and in more recent years one who has made a living in the insurance industry, I am keenly aware of the many issues confronting the log-chip-residue transportation segment. I have worked in the insurance side for 27 years, along the way joining others to form a group to help reduce logging equipment fire incidents. More recently I assisted in forming TEAM Safe Trucking, a non-profit that seeks to stabilize and improve the challenging transportation side by emphasizing driver selection and training and adherence to federal regulations. Over time I have become intently focused on the serious responsibilities that fall to the log truck owner. I see the driver and owner sharing the responsibilities for the safe, sustainable transportation of logs, chips and other residues. The driver is responsible for driving the truck in a safe and efficient manner and ensuring the truck is in a safe operating condition. The owner’s responsibilities—driver selection, truck-trailer mechanical condition, and compliance with government and insurance carrier requirements—begin earlier. Let me share a real-life story to emphasize the importance of following Federal Motor Carrier Administration (FMCA) requirements and insurance guidelines. ABC Timber Co. owned three tractor-trailer log trucks and, like many outfits, found it tough to hire and keep qualified, dependable drivers. Only two of its trucks were used because the owner could not find another suitable driver. The demand for logs began to increase, and ABC’s owner began thinking a lot about pulling in additional income with that third truck. He was approached by a man seeking a part-time job. The owner, who was somewhat selective in hiring, questioned the potential driver about his experience and driving record and was told that he had many years of experience driving log trucks and had a relatively clean MVR. The owner contacted his insurance company about adding the driver and was waiting for a return call. Trusting the man’s answers to be truthful, the owner decided to let the man get behind the wheel, fully expecting the insurance company to accept the driver. On the second day of employment the driver was headed to the mill with a load, traveling on a road he was not familiar with. He approached a slight curve with dip in the pavement. The speed he was traveling and the undetected dip caused the trailer to lean significantly to the right, and the driver over-corrected and lost control. The rig crossed the center line and rolled over on the driver’s side, spilling logs and trapping the driver. Unfortunately, the driver later died from his injuries. The truck and trailer were destroyed. A brief time later the owner was notified that his insurance coverages were being cancelled due to his failure to follow FMCA’s strict rules and insurance carrier guidelines. The owner faced a situation that could shut down his business. Here is a brief outline of a few actions that must be taken by any log truck owner prior to allowing a new hire to begin driving. —You must have a written application/copy of license on file for every CDL driver that you hire. —You must request, review and keep a copy of a Motor Vehicle Record for every CDL driver. —FMCSA requires truck owners to contact previous employers of CDL drivers. —Make sure that your insurance carrier approves a driver’s MVR before letting he or she drive. —All CDL drivers must be drug tested prior to employment, then placed in a consortium. —New drivers must pass a road test/ride along and it must be documented. 1. If the owner had either required the driver to bring his MVR report or waited for the insurance company to approve the driver after it reviewed the MVR, the owner would have realized the driver’s license was “invalid” due to the expiration of his health card. 2. The driver’s MVR revealed he would not be an acceptable driver based on most insurance company driving record guidelines. 3. The health card was not valid due to several medications the driver was taking for various conditions. Most of these medications carried the warnings, “may cause dizziness” or “drowsiness” as well as “do not drive a motor vehicle.” Several prescription containers with the driver’s name on them were found in the cab of the truck. 4. Blood samples taken at the hospital showed the driver tested positive for several of these drugs. The number of times this type of scenario has played out would be shocking to many, and it is far too common. Unfortunately, many of us in the insurance industry are not surprised. Time and time again we see claims forms come across our desks for accidents that could have easily been prevented. I have many concerns about loggers and truckers finding good drivers, and I have experienced these concerns personally. Finding and keeping good, dependable drivers, and paying them well will continue to be a major problem. 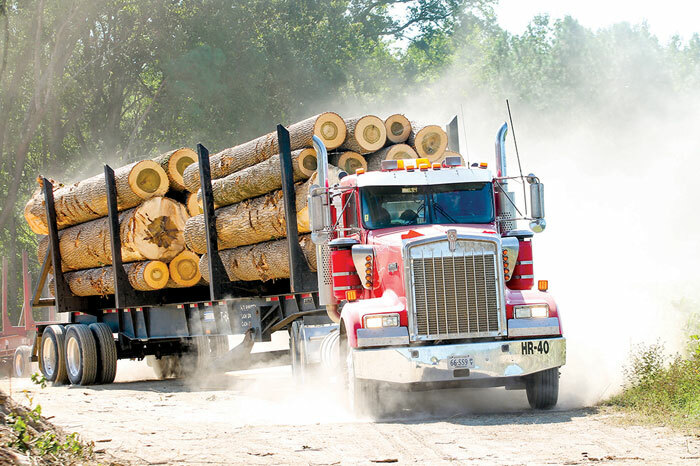 The diligent hiring of drivers is one of the most important responsibilities for loggers and log truckers. On any weekday around mid-afternoon there could have been a school bus meeting this log truck. Other times it could have been another truck or your family or my family. Please take driver selection seriously and follow all FMCA and Insurance Carrier requirements.